Clathrate hydrates, or gas clathrates, gas hydrates, clathrates, hydrates, etc., are crystalline water-based solids physically resembling ice, in which small non-polar molecules (typically gases) or polar molecules with large hydrophobic moieties are trapped inside "cages" of hydrogen bonded, frozen water molecules. In other words, clathrate hydrates are clathrate compounds in which the host molecule is water and the guest molecule is typically a gas or liquid. Without the support of the trapped molecules, the lattice structure of hydrate clathrates would collapse into conventional ice crystal structure or liquid water. Most low molecular weight gases, including O2, H2, N2, CO2, CH4, H2S, Ar, Kr, and Xe, as well as some higher hydrocarbons and freons, will form hydrates at suitable temperatures and pressures. Clathrate hydrates are not officially chemical compounds, as the sequestered molecules are never bonded to the lattice. The formation and decomposition of clathrate hydrates are first order phase transitions, not chemical reactions. Their detailed formation and decomposition mechanisms on a molecular level are still not well understood. Clathrate hydrates were first documented in 1810 by Sir Humphry Davy who found that water was a primary component of what was earlier thought to be solidified chlorine. Clathrates have been found to occur naturally in large quantities. Around 6.4 trillion (6.4×1012) tonnes of methane is trapped in deposits of methane clathrate on the deep ocean floor. Such deposits can be found on the Norwegian continental shelf in the northern headwall flank of the Storegga Slide. Clathrates can also exist as permafrost, as at the Mallik gas hydrate site in the Mackenzie Delta of northwestern Canadian Arctic. These natural gas hydrates are seen as a potentially vast energy resource, but an economical extraction method has so far proven elusive. Hydrocarbon clathrates cause problems for the petroleum industry, because they can form inside gas pipelines, often resulting in obstructions. Deep sea deposition of carbon dioxide clathrate has been proposed as a method to remove this greenhouse gas from the atmosphere and control climate change. Clathrates are suspected to occur in large quantities on some outer planets, moons and trans-Neptunian objects, binding gas at fairly high temperatures. Cages building the different gas hydrate structures. 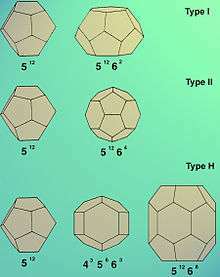 Gas hydrates usually form two crystallographic cubic structures: structure (Type) I (named sI) and structure (Type) II (named sII) of space groups and respectively. Seldom, a third hexagonal structure of space group may be observed (Type H). The unit cell of Type I consists of 46 water molecules, forming two types of cages – small and large. The unit cell contains two small cages and six large ones. The small cage has the shape of a pentagonal dodecahedron (512) (which is not a regular dodecahedron) and the large one that of a tetradecahedron, specifically a hexagonal truncated trapezohedron (51262). Together, they form a version of the Weaire–Phelan structure. Typical guests forming Type I hydrates are CO2 in carbon dioxide clathrate and CH4 in methane clathrate. The unit cell of Type II consists of 136 water molecules, again forming two types of cages – small and large. In this case there are sixteen small cages and eight large ones in the unit cell. The small cage again has the shape of a pentagonal dodecahedron (512), but the large one is a hexadecahedron (51264). Type II hydrates are formed by gases like O2 and N2. The unit cell of Type H consists of 34 water molecules, forming three types of cages – two small ones of different types, and one "huge". In this case, the unit cell consists of three small cages of type 512, two small ones of type 435663 and one huge of type 51268. The formation of Type H requires the cooperation of two guest gases (large and small) to be stable. It is the large cavity that allows structure H hydrates to fit in large molecules (e.g. butane, hydrocarbons), given the presence of other smaller help gases to fill and support the remaining cavities. Structure H hydrates were suggested to exist in the Gulf of Mexico. Thermogenically-produced supplies of heavy hydrocarbons are common there. Iro et al., trying to interpret the nitrogen deficiency in comets, stated most of the conditions for hydrate formation in the protoplanetary nebulae, surrounding the pre-main and main sequence stars were fulfilled, despite the rapid grain growth to meter scale. The key was to provide enough microscopic ice particles exposed to a gaseous environment. Observations of the radiometric continuum of circumstellar discs around -Tauri and Herbig Ae/Be stars suggest massive dust disks consisting of millimeter-sized grains, which disappear after several million years (e.g.,). A lot of work on detecting water ices in the Universe was done on the Infrared Space Observatory (ISO). For instance, broad emission bands of water ice at 43 and 60 μm were found in the disk of the isolated Herbig Ae/Be star HD 100546 in Musca. The one at 43 μm is much weaker than the one at 60 μm, which means the water ice, is located in the outer parts of the disk at temperatures below 50 K. There is also another broad ice feature between 87 and 90 μm, which is very similar to the one in NGC 6302  (the Bug or Butterfly nebula in Scorpius). Crystalline ices were also detected in the proto-planetary disks of ε-Eridani and the isolated Fe star HD 142527 in Lupus. 90% of the ice in the latter was found crystalline at temperature around 50 K. HST demonstrated that relatively old circumstellar disks, as the one around the 5-million-year-old B9.5Ve Herbig Ae/Be star HD 141569A, are dusty. Li & Lunine found water ice there. Knowing the ices usually exist at the outer parts of the proto-planetary nebulae, Hersant et al. proposed an interpretation of the volatile enrichment, observed in the four giant planets of the Solar System, with respect to the Solar abundances. They assumed the volatiles had been trapped in the form of hydrates and incorporated in the planetesimals flying in the protoplanets’ feeding zones. Kieffer et al. (2006) suggest that the geyser activity in the south polar region of Saturn's moon Enceladus originates from clathrate hydrates, where carbon dioxide, methane, and nitrogen are released when exposed to the vacuum of space by the "Tiger Stripe" fractures found in that area. Carbon dioxide clathrate is believed to play a major role in different processes on Mars. Hydrogen clathrate is likely to form in condensation nebulae for gas giants. Naturally on Earth gas hydrates can be found on the seabed, in ocean sediments, in deep lake sediments (e.g. Lake Baikal), as well as in the permafrost regions. The amount of methane potentially trapped in natural methane hydrate deposits may be significant (1015 to 1017 cubic metres), which makes them of major interest as a potential energy resource. Catastrophic release of methane from the decomposition of such deposits may lead to a global climate change, because CH4 is more of an efficient greenhouse gas than CO2 (see Atmospheric methane). The fast decomposition of such deposits is considered a geohazard, due to its potential to trigger landslides, earthquakes and tsunamis. However, natural gas hydrates do not contain only methane but also other hydrocarbon gases, as well as H2S and CO2. Air hydrates are frequently observed in polar ice samples. Pingos are common structures in permafrost regions. Similar structures are found in deep water related to methane leakages. Significantly, gas hydrates can even be formed in the absence of a liquid phase. Under that situation, water is dissolved in gas or in liquid hydrocarbon phase. Thermodynamic conditions favouring hydrate formation are often found in pipelines. This is highly undesirable, because the clathrate crystals might agglomerate and plug the line and cause flow assurance failure and damage valves and instrumentation. The results can range from flow reduction to equipment damage. Hydrates have a strong tendency to agglomerate and to adhere to the pipe wall and thereby plug the pipeline. Once formed, they can be decomposed by increasing the temperature and/or decreasing the pressure. Even under these conditions, the clathrate dissociation is a slow process. The most common thermodynamic inhibitors are methanol, monoethylene glycol (MEG), and diethylene glycol (DEG), commonly referred to as glycol. All may be recovered and recirculated, but the economics of methanol recovery is not favourable in most cases. MEG is preferred over DEG for applications where the temperature is expected to be −10 °C or lower due to high viscosity at low temperatures. Triethylene glycol (TEG) has too low vapour pressure to be suited as an inhibitor injected into a gas stream. More methanol is lost in the gas phase when compared to MEG or DEG. The use of kinetic inhibitors and anti-agglomerants in actual field operations is a new and evolving technology. It requires extensive tests and optimisation to the actual system. While kinetic inhibitors work by slowing down the kinetics of the nucleation, anti-agglomerants do not stop the nucleation, but stop the agglomeration (sticking together) of gas hydrate crystals. These two kinds of inhibitors are also known as low dosage hydrate inhibitors, because they require much smaller concentrations than the conventional thermodynamic inhibitors. Kinetic inhibitors, which do not require water and hydrocarbon mixture to be effective, are usually polymers or copolymers and anti-agglomerants (requires water and hydrocarbon mixture) are polymers or zwitterionic — usually ammonium and COOH — surfactants being both attracted to hydrates and hydrocarbons. ↑ Gao S; House W; Chapman WG (2005). "NMR MRI Study of Gas Hydrate Mechanisms". The Journal of Physical Chemistry B. American Chemical Society. 109 (41): 19090–19093. doi:10.1021/jp052071w. PMID 16853461. Retrieved August 3, 2009. ↑ Gao S; Chapman WG; House W (2005). "NMR and Viscosity Investigation of Clathrate Formation and Dissociation". Ind. Eng. Chem. Res. Americal Chemical Society. 44 (19): 7373–7379. doi:10.1021/ie050464b. Retrieved August 3, 2009. ↑ Michael Faraday (November 2004). On Hydrate of Chlorine. Quarterly Journal of Science. Retrieved 20 March 2014. ↑ Buffett, B.; Archer, D. (2004). "Global inventory of methane clathrate: sensitivity to changes in the deep ocean". Earth Planet. Sci. Lett. : 185–199. Bibcode:2004E&PSL.227..185B. doi:10.1016/j.epsl.2004.09.005. ↑ Sloan E. D., Jr. (1998) Clathrate hydrates of natural gases. Second edition, Marcel Dekker Inc.:New York. ↑ Iro, N.; Gautier, D.; Hersant, F.; Bockelée-Morvan, D.; Lunine, J. I. (2003). "An interpretation of the Nitrogen deficiency in comets". Icarus. 161 (2): 513. Bibcode:2003Icar..161..511I. doi:10.1016/S0019-1035(02)00038-6. ↑ Beckwith, S. V. W.; Henning, T.; Nakagawa, Y. (2000). "Dust properties and assembly of large particles in protoplanetary disks". Protostars and Planets. IV: 533. arXiv:astro-ph/9902241 . Bibcode:2000prpl.conf..533B. ↑ Natta, A.; Grinin, V.; Mannings, V. (2000). "Properties and Evolution of Disks around Pre-Main-Sequence Stars of Intermediate Mass". Protostars and Planets. IV: 559. hdl:2014/17884. ↑ Li, Aigen; Lunine, J. I.; Bendo, G. J. (2003). "Modeling the infrared emission from the ε-Eridani disk". The Astrophysical Journal. 598: L51–L54. arXiv:astro-ph/0311069 . Bibcode:2003ApJ...598L..51L. doi:10.1086/380495. ↑ Malfait, K.; Waelkens, C.; Bouwman, J.; De Koter, A.; Waters, L. B. F. M. (1999). "The ISO spectrum of the young star HD 142527". Astronomy and Astrophysics. 345: 181. Bibcode:1999A&A...345..181M. ↑ Clampin, M.; Krist, J. E.; Ardila, D. R.; Golimowski, D. A.; Hartig, G. F.; Ford, H. C.; Illingworth, G. D.; Bartko, F.; Bentez, N.; Blakeslee, J. P.; Bouwens, R. J.; Broadhurst, T. J.; Brown, R. A.; Burrows, C. J.; Cheng, E. S.; Cross, N. J. G.; Feldman, P. D.; Franx, M.; Gronwall, C.; Infante, L.; Kimble, R. A.; Lesser, M. P.; Martel, A. R.; Menanteau, F.; Meurer, G. R.; Miley, G. K.; Postman, M.; Rosati, P.; Sirianni, M.; et al. (2003). "Hubble Space TelescopeACS Coronagraphic Imaging of the Circumstellar Disk around HD 141569A". The Astronomical Journal. 126: 385. arXiv:astro-ph/0303605 . Bibcode:2003AJ....126..385C. doi:10.1086/375460. ↑ Li, A.; Lunine, J. I. (2003). "Modeling the infrared emission from the HD 141569A disk". Astrophysical Journal. 594 (2): 987–1010. arXiv:astro-ph/0311070 . Bibcode:2003ApJ...594..987L. doi:10.1086/376939. ↑ Hersant, F (2004). "Enrichment in volatiles in the giant planets of the Solar System". Planetary and Space Science. 52 (7): 623–641. Bibcode:2004P&SS...52..623H. doi:10.1016/j.pss.2003.12.011. ↑ Kieffer, Susan W.; Xinli Lu; Craig M. Bethke; John R. Spencer; Stephen Marshak; Alexandra Navrotsky (2006). "A Clathrate Reservoir Hypothesis for Enceladus' South Polar Plume". Science. 314 (5806): 1764–1766. Bibcode:2006Sci...314.1764K. doi:10.1126/science.1133519. PMID 17170301. ↑ Kvenvolden, K. A.; McMenamin, M. A. (1980). "Hydrates of Natural Gas: Their Geologic Occurrence". U. S. Geological Survey Circular. 825. ↑ Ussler, W.; Paull, C. K.; Lorenson, T.; Dallimore, S.; Medioli, B.; Blasco, S.; McLaughlin, F.; Nixon, F. M. (December 2005). "Methane Leakage from Pingo-like Features on the Arctic Shelf, Beaufort Sea, NWT, Canada". American Geophysical Union. SAO/NASA ADS. 11: 1069. Bibcode:2005AGUFM.C11A1069U. ↑ Gao, Shuqiang (2008). "Investigation of Interactions between Gas Hydrates and Several Other Flow Assurance Elements". Energy & Fuels. 22 (5): 3150–3153. doi:10.1021/ef800189k. Shuqiang Gao, Waylon House, and Walter Chapman, “NMR/MRI Study of Clathrate Hydrate Mechanisms”, J. Phys. Chem. B, 109(41), 19090–19093, 2005. Wikimedia Commons has media related to Gas hydrates.